dBayer Healthcare (J.W. ), Whippany, New Jersey. 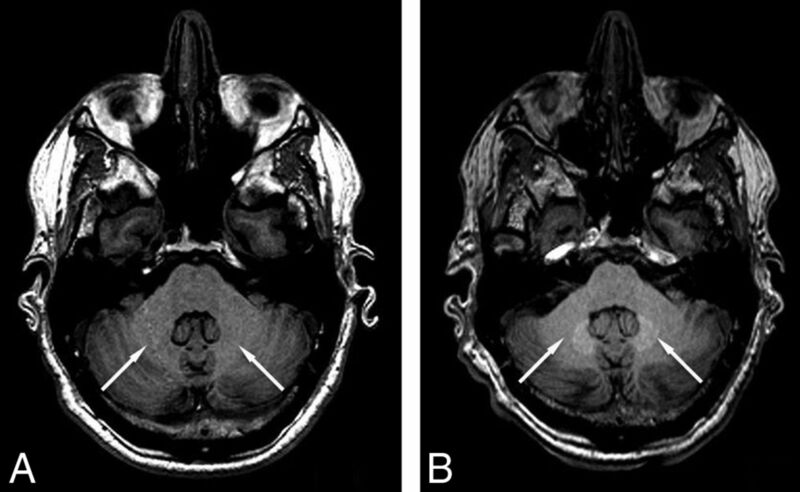 BACKGROUND AND PURPOSE: In view of the recent observations that gadolinium deposits in brain tissue after intravenous injection, our aim of this study was to compare signal changes in the globus pallidus and dentate nucleus on unenhanced T1-weighted MR images in patients receiving serial doses of gadobutrol, a macrocyclic gadolinium-based contrast agent, with those seen in patients receiving linear gadolinium-based contrast agents. MATERIALS AND METHODS: This was a retrospective analysis of on-site patients with brain tumors. Fifty-nine patients received only gadobutrol, and 60 patients received only linear gadolinium-based contrast agents. Linear gadolinium-based contrast agents included gadoversetamide, gadobenate dimeglumine, and gadodiamide. T1 signal intensity in the globus pallidus, dentate nucleus, and pons was measured on the precontrast portions of patients' first and seventh brain MRIs. Ratios of signal intensity comparing the globus pallidus with the pons (globus pallidus/pons) and dentate nucleus with the pons (dentate nucleus/pons) were calculated. Changes in the above signal intensity ratios were compared within the gadobutrol and linear agent groups, as well as between groups. RESULTS: The dentate nucleus/pons signal ratio increased in the linear gadolinium-based contrast agent group (t = 4.215, P < .001), while no significant increase was seen in the gadobutrol group (t = −1.422, P = .08). The globus pallidus/pons ratios followed similarly, with an increase in the linear gadolinium-based contrast agent group (t = 2.931, P < .0001) and no significant change in those receiving gadobutrol (t = 0.684, P = .25). 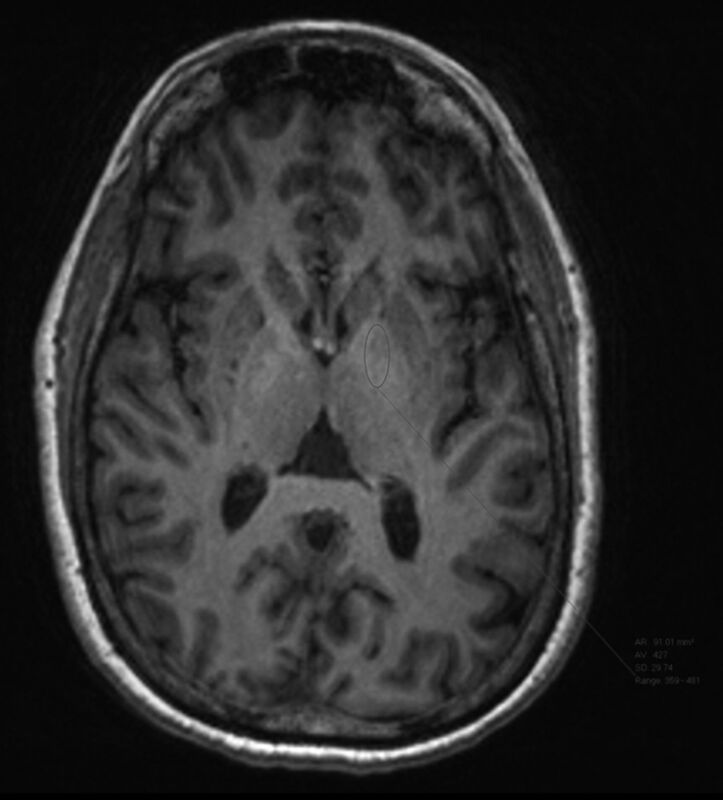 CONCLUSIONS: Successive doses of gadobutrol do not result in T1 shortening compared with changes seen in linear gadolinium-based contrast agents. Whole-brain MR imaging was performed using 1.5T (Symphony; Siemens, Erlangen, Germany) or 3T (Verio; Siemens) MR imaging units. Unenhanced T1-weighted MR images (3D MPRAGE) were obtained with the following parameters on 1.5T systems: TR = 1330 ms; TE = 4.8 ms; TI = 800 ms; flip angle = 15°; section thickness = 12.5 mm; matrix size = 256 × 192; echo-train length = 1. T1-weighting parameters on 3T systems were the following: TR = 2100 ms; TE = 3.0 ms; TI = 900 ms; flip angle = 9°; section thickness = 11 mm; matrix size = 256 × 256; echo-train length = 1. Following institutional review board approval, patients were retrospectively selected from among neuroimaging patients at Cedars-Sinai Medical Center. Informed consent was waived given the retrospective nature of the study. The population selected for study consisted of patients who had undergone at least 7 prior contrast-enhanced MR imaging examinations. Due to the relative frequency of contrast-enhanced examinations associated with standard care, all patients had intra-axial malignancy, most commonly anaplastic astrocytoma or glioblastoma multiforme. All patients receiving gadolinium contrast agents had been screened for renal failure with serum creatinine levels. As a result of an institution-wide contrast formulary policy change, it was simple to determine which contrast agents patients received. Before 2011, our institution had exclusively used linear, nonionic contrast agents, gadoversetamide (OptiMARK; Covidien, Irvine, California) and, to a lesser extent, gadodiamide (Omniscan; GE Healthcare, Piscataway, New Jersey). Between 2011 and February 2012, gadobenate dimeglumine (MultiHance; Bracco Diagnostics), a linear, ionic GBCA, became the primary contrast agent. After February 2012, we began to exclusively use gadobutrol (Gadavist), a macrocyclic GBCA, for all neuroimaging. This allowed us to have a population of patients who had received only the macrocyclic agent gadobutrol to compare against an earlier population who had received only linear GBCAs. 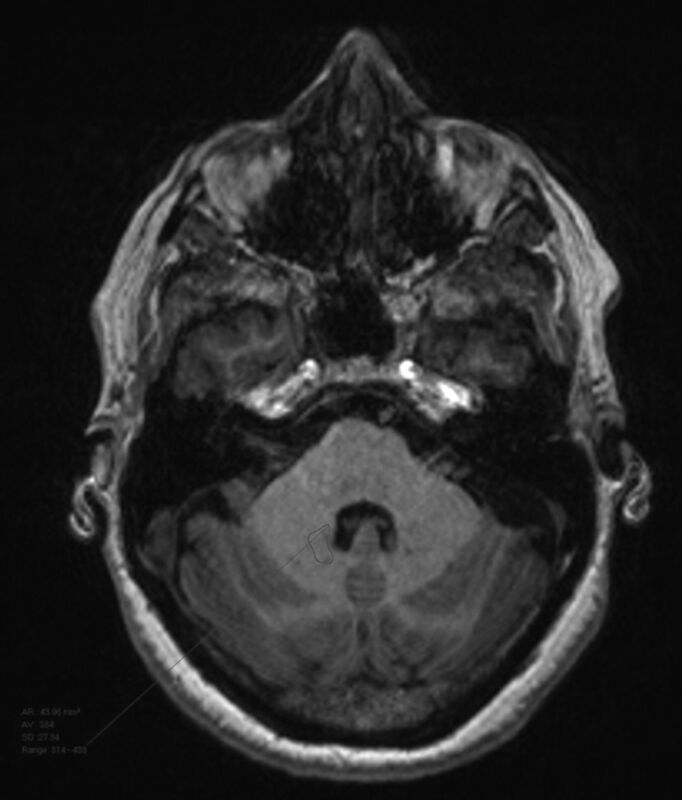 We used the following inclusion criteria: 1) Patients must have undergone at least 7 consecutive studies with gadobutrol or at least 7 scans with only linear contrast agents (OptiMARK, MultiHance, and Omniscan); 2) initial and final MRIs had both pre- and postcontrast T1-weighted images; 3) one class of contrast agent was exclusively used for all 7 examinations, either macrocyclic (exclusively gadobutrol) or linear (any combination of those mentioned above); 4) at least 1 basal ganglion and the posterior fossa were spared tumor or radiation effects; 5) subjects had normal renal function, defined as a glomerular filtration rate of >30; and 6) the seventh examination occurred at least 2 weeks following the sixth. Patients were excluded on the basis of the following: 1) tumor- or treatment-related change in the posterior fossa or bilateral globi pallidi; and 2) abnormal baseline T1 signal intensity ratio of >1:1 when comparing the DN with the pons. The study population was divided into 2 groups: Group 1 included patients who received only gadobutrol, and group 2 included patients who received only linear contrast agents (OptiMARK, MultiHance, Omniscan). Following exclusion, group 1 contained 59 patients while group 2 contained 60. Anonymized data for each group were collected using Excel (Microsoft, Redmond, Washington) and were stored on-site in an encrypted fashion. Two radiologists conducted a quantitative analysis of unenhanced T1-weighted images using ROI measurements. Measurements were made on the baseline scan and the seventh scan. In keeping with previously described techniques, ROIs were drawn over the left globus pallidus, dentate nucleus, lateral ventricle, and pons, and average signal intensity was recorded.12,19 Examples of ROI selection are presented as Figs 1⇓–3. We compared DN and GP signal intensities with T1 measurements of the pons and calculated the ratios of these intensities: dentate nucleus/pons (DN/pons) and globus pallidus/pons (GP/pons).12 If the left side could not be evaluated due to artifacts or pathology, the right side was used. In keeping with other authors' methods, it was decided that it would be best to compare ratios between the GP and pons as well as the DN and pons. Paired t tests were used to compare changes within a given group (ie, the gadobutrol group or the linear agent group) between the first and seventh examinations. Wilcoxon rank sum tests were used for between-group comparisons of the percentage change in the signal intensity ratio (either DN/pons or GP/pons) seen during the patients' 7 examinations. All statistical analysis was performed with Statistical Analysis Software, Version 9.2 (SAS Institute, Cary, North Carolina). Consistent with expectations, a significant signal intensity increase was detected in the DN/pons ratio by the seventh examination in the linear agent group (t = 4.215, P < .001; Table 1). A sample pair of images showing the signal increase is shown in Fig 4. No significant change was demonstrated in the group receiving gadobutrol (t = −1.422, P = .08; Table 1). The difference between the signal changes seen in these 2 groups was also significant (+3.10% for those receiving linear GBCA; −0.8% for patients receiving gadobutrol; P < .0001; Fig 5 and Table 2). Sample images showing obvious signal increase, indicated by arrows, after 6 injections of linear GBCAs (B) compared with the baseline scan (A). Group histograms for the relative percentage change in the DN/pons ratio from 1 to 7. Similarly, a significant increase was seen in the GP/pons ratio in the linear agent group between the first and seventh examinations (t = 2.931, P = .002; Table 1), while no such increase was seen in the group receiving gadobutrol (t = 0.684, P = .25; Table 1). Again, the difference in the percentage change between these groups was significant (+2.47% for the linear GBCA group; −0.30% in the gadobutrol group, P = .033; Fig 6 and Table 2). Group histograms for the relative percentage change in the GP/pons ratio from 1 to 7. The demonstration of a stable DN/pons T1 signal intensity ratio over subsequent administrations of gadobutrol supports the growing preponderance of evidence suggesting that macrocyclic GBCAs, as a class, are less likely to deposit gadolinium in the brain. As with previous examinations, the use of linear GBCAs was found to result in increased T1 signal in the globus pallidus and dentate nucleus. There are several limitations to our study. Patient age was not controlled for, in favor of improving sample size. While all patients were seen for malignancy, nearly all with anaplastic astrocytoma or glioblastoma multiforme, the distributions of these malignancies and relative chemotherapy effects were not controlled for. 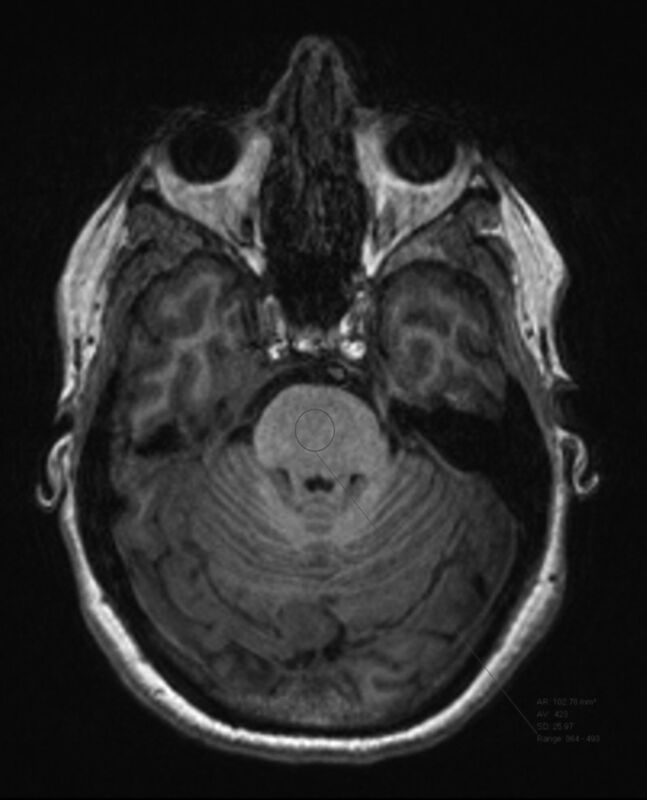 The damage to the BBB caused by disease processes, treatment, or both is also a potential confounding variable because most patients undergoing repeat brain MRIs have a known intracranial malignancy. Both 1.5T and 3T systems were used. While most examinations were performed at 1.5T, differences in equipment may have resulted in slight variations on measurements. There was also no intra-/interobserver agreement separately before this study because the average signal intensity measurement is normally less sensitive to intra-/interobserver variations. Our study has only explored the contribution of gadobutrol to signal intensity change in up to 7 injections, so the possibility of observing a signal intensity increase cannot be excluded in patients with even higher cumulative gadobutrol injection doses. Even though we tried to ensure the completeness of all participants' medical records, the possibility of any unknown prior GBCA usage cannot be excluded for all patients. Although most studies in the literature on the gadolinium deposition topic are MR imaging–based, inductively coupled plasma mass spectrometry–based postmortem tissue sampling studies, which have much higher sensitivity to the existence of gadolinium atoms, have also been conducted in both preclinical and clinical studies. Because of the higher sensitivity of inductively coupled plasma mass spectrometry techniques, deposits from both linear and macrocyclic agents have been reported,20⇓⇓–23 though the amount of deposition from macrocyclic agents was found to be much lower than from linear counterparts. Presumably, they are not as easily detected by standard T1-weighted MR imaging because of the lower deposition rate of macrocyclic agents. Most interesting, while not statistically significant, patients receiving gadobutrol showed an unexpected decrease in signal intensity in both the DN and GP between the first and seventh studies. The decrease in the DN/pons ratio was found to be nearly significant at P = .08. Because linear GBCA administration before 2012 was not controlled for in the gadobutrol group, it is possible that this decrease reflects the results of clearance of previously deposited gadolinium from prior administrations, which may corroborate developing research on clearance and the efficacy of a “gadolinium holiday.”24 Alternatively, this nonsignificant signal decrease could also be caused by the bias in patient sampling and in signal measurement inherent in ROI-based analysis. Patients exposed to gadobutrol, a macrocyclic agent, failed to show a demonstrable change in T1 signal intensity in the regions of the brain classically susceptible to gadolinium deposition. This finding corroborates evidence suggesting that macrocyclic agents are less likely to cause signal increase on nonenhanced T1WI MR images than linear GBCAs. Disclosures: Franklin G. Moser—RELATED: Grant: Bayer Healthcare, Comments: grant to conduct research. * Christopher T. Watterson—RELATED: Grant: Bayer Healthcare, Comments: educational grant. * Sasha Weiss—RELATED: Grant: Bayer Healthcare. * James Mirocha—RELATED: Grant: Bayer Healthcare. * Jinnan Wang—UNRELATED: Employment: Bayer Healthcare; Stock/Stock Options: Bayer Healthcare. *Money paid to the institution. This work was supported by Bayer Healthcare, Project No. 00042369. Accepted after revision November 15, 2017.